Usually this phrase involves some kind of weather drill. Not this time though!! This activity works well with children ages 2-4 year olds. Throw the blanket over the table. Another perfect excuse to talk about positional concepts such as OVER and UNDER. 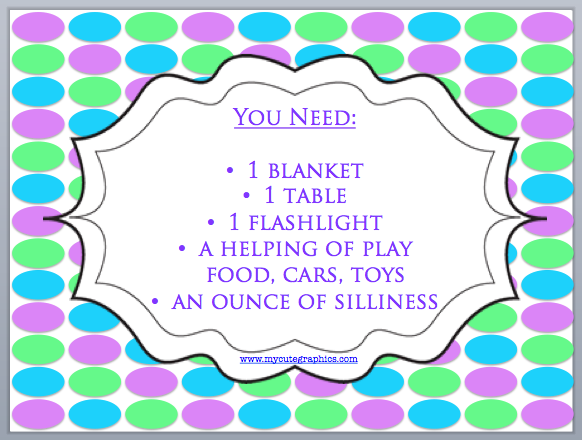 “We will put this blanket OVER the table, then we can sit UNDER the table and have some fun.” Grab your box of goodies and head on under! 1. Use play food and have a picnic: There are a ton of opportunities to work on naming and sorting food, positional concepts (on/off the plate), plurals (“I’d like some chips”), pronouns, verbs (“I am eating an apple. You are eating a banana”), possessives (“This is my fork. That is your spoon”), and much more! 2. Use cars or trucks and design a road: This would work well as an articulation practice activity. Place flashcards (or index cards with words written on them) all around. Drive your cars over the cards and practice using good articulation. This would be great for positional concepts (“I’m driving my car OUT and back IN”), verbs, pronouns, etc. 3. Puppet show: If you have a flashlight, grab a few puppets (or socks)! You can hold the flashlight and have endless conversations as the characters of your choice. 4. Practice inviting others: Take turns exiting your cave and “knocking” so you can be let in. You and your child/student can practice polite ways to greet others, asking to join an activity, manners, and appropriately leaving an activity. 5. Tell a story: Since everything is more fun when you’re under a table, even something as simple as reading or telling a story together can be more exciting! Bonus Tip: Some tables that I have seen have a magnetic pole. I have had a healthy dose of fun sticking magnets to the pole! Vocabulary, following directions, verbs (put on, take off), WH questions…. As with any activity, make it fun and don’t be afraid to be a little silly. Who would’ve thought you could have so much fun under a table?! Thank you to Katie for allowing me to be a guest blogger! Today’s contributor is the anonymous author of Teach Speech 365. She is an ASHA certified SLP who enjoys creating materials to share with fellow SLPs, parents, teachers, and other professionals. She also loves to share information regarding all things related to speech language pathology! Check out her blog, FaceBook, TpT store, or Pinterest page for more fun tips and tricks!